Coachman's Inn Warwick is towns' luxury motel comprising of 29 well appointed units of differing configurations as well as two bedroom serviced apartments. The self contained two bedroom apartments, are aimed at those staying longer in their district with a minimum two night stay. One of the many benefits of Coachman's Inn Warwick is that it is a two minute drive to the town centre, tourist attractions and all civil and commercial facilities. The Warwick hospital is less than a kilometre from the front door. Conveniently situated at the cross roads to Brisbane, Sydney and Melbourne, Coachman's Inn Warwick can assure a great nights' sleep in the acoustically designed suites. 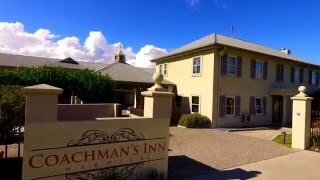 Coachman's Inn Warwick is a family business and go the extra mile to proudly offer a high standard of service to ensure guests experience terrific hospitality, regardless of whether you are a guest of the Motel or a guest dining in the fully licensed bar and grill. Catering and private functions are a specialty. Fully self-contained apartments, perfect for those who are visiting Warwick for a longer stay. Each two storey townhouse apartment consists of two bedrooms, one with a king bed the other with two single beds. There is also a sofa lounge and a mattress for sleeping a maximum of six people. A fully equipped kitchen is provided along with two separate toilets. Ideal for families, friends, wedding parties and more. A weekly rate is available by speaking with reception. Two rooms geared for people with less mobility. One has a queen bed, and wheelchair friendly bathroom. The second room has a queen bed and a single bed also with wheel chair friendly bathroom. Dual key suite comprising two rooms, each with their own bathroom, mini bar, tea making facilities, Austar, broadband. Ideal for those wanting to have separate sleeping quarters for parents and children or wedding parties. Weekend rates apply (Saturday night) AUD10 additional. Comfortable suite with custom made timber furniture, queen bed and single bed, DVD player, broadband internet capability, separate writing desk, large walk-in shower, mini-bar and room service. Used as either a twin room or for family of three. Weekend tariff (Saturday night) please add an additional AUD10. Comfortable suite with custom made timber furniture, queen bed, DVD player, broadband internet capability, separate writing desk, large walk-in shower, mini-bar and room service. Weekend tariff (Saturday night) please add an additional AUD15. A room designed for families. Bedding is comprised a king bed, two singles and a trundle bed sleeping five comfortably. The bathroom has a full size spa bath, perfect for toddlers and babies, as well as a large walk in shower. Austar and minibar, as well as tea and coffee making facilities are included. Weekend tariff's (Saturday) apply - please add AUD10. Large suite comprising King Bed, Austar, DVD player, broadband internet capability, separate writing desk, corner spa-bath and large walk-in shower, min-bar and room service. Weekend tariff (Saturday night) an additional AUD10 applies. A room suitable for family sleeping a maximum of four adults. The bedding is comprised of a queen bed, single bed and a trundle. Austar and tea and coffee making facilities are included. A mini bar is also available. Weekend tariff applies (Saturday night) please add AUD10.